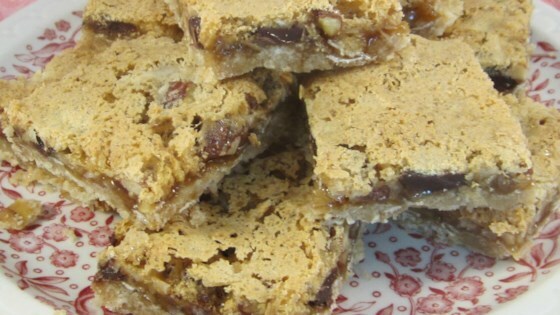 "A two layer cookie bar made with brown sugar, shredded coconut, nut meats plus oatmeal." Cream the shortening with 1/2 cup of the brown sugar. Add 1 cup of the flour, the salt and the oats and blend. Press into the bottom of one 8x12 inch baking dish. Bake at 350 degrees F (175 degrees C) for 15 minutes. Beat eggs well. Then beat in the 1 cup brown sugar and the vanilla. Stir in the 2 tablespoons flour and baking powder, blending well. Stir in the coconut and pecans. Spread over the top of the baked bottom layer. Return dish to oven and bake for an additional 15 to 20 minutes at 300 degrees F (150 degrees C). Let cool then cut into 2 inch bars and wrap in plastic wrap before storing in an airtight container. See how to make deliciously decadent no-bake treats. You need to sub out Chocolate chips for cocconut, and add apple toffee. Thats whats in the potbelly dream bar. DELICIOUS!! Exactly what i was looking for! This was a little too sweet for us. I added some dark chocolate chips because my hubby always wants chocolate in his desserts and it gave it a little something extra.